The short answer is no one. As the United States takes an increasingly narrow and punitive view of economics, we find ourselves on the edge of economic recession. 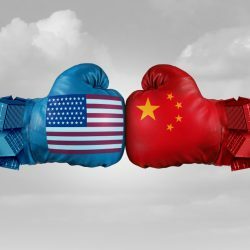 Not unlike the Smoot-Hawley era during the Great Depression, tariffs are creating a rift with the international community and threatening the existing global order. On this episode of New Business Paradigms, featuring Kristy Jansen and Rinaldo Brutoco, we dive into the US trade war, protectionist policies, and their impacts on the global economy. Rinaldo helps explain how the United States influenced the creation of a favorable economic system in the post World War II era and the changes occurring as the US begins to back out of the globalized world. Specifically, the episode focuses on the changing status of currency and the evolving role of cryptocurrency. The show begins and ends with talk about climate change; the danger of record heat waves and trying to slow the global coral die-off.